Systems and infrastructure are not the centerpiece of any education system, and they may not make exciting headlines. But they can be the difference between success and struggle for school system leaders — as Oakland has proven time and again. That’s why it matters so much that the next superintendent builds systems to support schools and implement thoughtful initiatives. 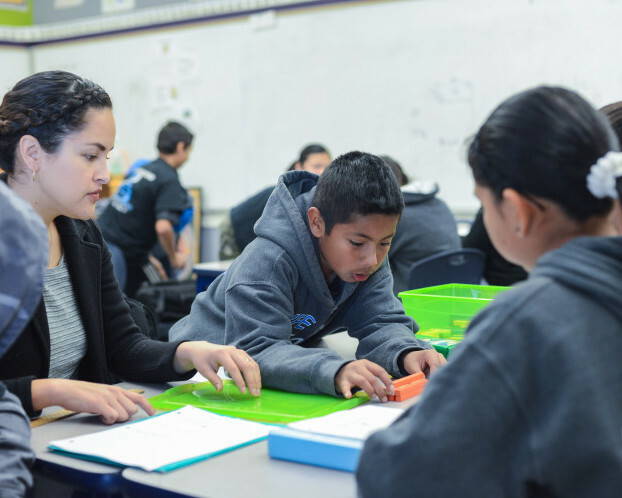 Building systems can be daunting and complicated work, but it is necessary if OUSD is going to get to a better way of serving students, educators, and schools. In conversations with leaders about the opportunities and challenges that will face OUSD’s next Superintendent, some central themes around district systems and infrastructure emerged. We capture the most common of these themes below. Financial Infrastructure: Obviously this is at the top of everybody’s list right now, but when the attention is not quite as intense, it will be even more important that the new superintendent has the desire and ability to solve OUSD’s recurring fiscal problems. This work is complicated, but it really affects every aspect of OUSD’s work. Some of the current budget struggles are rooted in our failure to invest in the basic infrastructure necessary to run a $700 million organization. For example, running payroll often requires overtime expenses because the technology and process is so inefficient. Budgeting errors occur because entering financial data is so difficult with our current system. The financial system is not well connected to the Human Resources (HR) department and it does not collect the kind of information that HR needs to function properly. All of these lead to data quality breakdowns, inefficient use of staff time, and compromised strategic planning. This is avoidable; with better systems, it’s easier to enter data, run payroll, and stay coordinated with human resources teams. To improve outcomes for students, the district will need to be able to make smart strategic data based decisions. In order to do that, the district needs to be clear about what kinds of data its various systems need to collect to informs those decisions. Think and plan for the long term: Given the high level of leadership turnover, a common theme was the need to think in the long term about program development, infrastructure investment, and measuring impact. Many expressed that short-term thinking has hampered OUSD’s ability to be strategic in program implementation. We look for unrealistic results too quickly. A new leader will have to stabilize and build upon the mid-level leadership that can execute realistic implementation plans. Those plans need to correctly balance the urgency for students with the need to think about long-term sustainability and fiscal stability. Fewer Initiatives/Programs: There have been a lot of new leaders, and with each new leader come a slew of new initiatives. As one teacher said in describing a central program, “It feels like a solution looking for a problem. They should have come and talked to us about what problems we actually have.” District leaders emphasized the importance of figuring out which of these programs is really delivering for students and which should be cut or rethought. Setting clear goals at the program level will give the district clear insights into whether the program is delivering for students or educators. During this past budget crisis, this performance information was not readily available and it meant that the district was not able to make strategic cuts with strong and clear evidence. A few leaders also raised the need to change a central office culture which is too political, does not encourage challenging each other’s thinking, and does not create space for leaders to admit to challenges and need to adjust plans. Aligning and simplifying: Another common theme among these leaders was the need to align the central office in service of school sites and to simplify district operations. For example, there are currently at least three different ways that schools are assigned staff or funding (these three are the general funding formula, additional funding through the Elevate Network, and the budget appeals process, [plus Measure N funding]). Each has its rationale, but there is also value to certainty, clarity and simplicity. If a superintendent wants to better align budget timelines to support school site planning, that work will need to be complete months in advance of schools receiving their budgets. This also speaks to the time and stability needed for implementing meaningful change. Leadership Pipeline: A few district leaders commented on OUSD’s failure to develop a pipeline of leaders prepared to assume increasing leadership in the district. They had seen new leaders promoted too quickly and without enough support to be successful in their roles. Because of this, some of those leaders left and others were less effective than they could have been. The new superintendent has the opportunity to help develop leaders who can be successful in their work and move into larger roles as they are ready. Done right, this also means that when senior leadership opportunities arise, there is a deliberately prepared group of leaders within the system who are ready to step into those roles. This means less reliance on expensive searches and senior leaders from outside of Oakland. However, this will have to be an active, prioritized goal. The challenge they acknowledged is that everybody is so busy that is it hard to build the time for this type of leadership cultivation.